DVD Ripper Pro is close to perfection. It takes a potentially complex task and makes it wonderfully quick and simple, while still offering incredible range of options and output formats. Let's get this out of the way right from the start – DVD ripping software like this can be used for both legal and illegal purposes. WonderFox points out that DVD Ripper Pro can not only bypass DVD content scramble system (CSS) and region coding, but also remove a variety of protection techniques. What you chose to do with the software is up to you. Just keep in mind the law that governs your activities where you are in the world. You can rip a full-length DVD in around 10-20 minutes, and DVD Ripper Pro supports a huge range of formats, including AVI, MP4, MKV, MPG, WMV, MOV, MTS, M4V, ASF, DVC, MTS, M2TS, WEBM, FLV, SWF, VOB, F4V and 3GP for starters. You might think that ripping a disc and choosing a suitable audio and video codec would be a nightmare, particularly if you're keen to preserve quality while dramatically reducing file size, but that's not the case here. 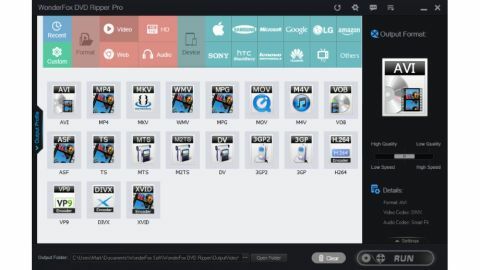 There's a selection of pre-defined video profiles to choose from, and these are perfect for ripping DVDs for playback on particular devices, including phones and tablets. If you're feeling brave, you can get more involved and tinker with settings like framerates and codecs, but you'll probably find that the defaults work perfectly. WonderFox DVD Ripper Pro does an excellent job of simplifying what could otherwise be quite a complicated task. Fire up the program, pop in a DVD (you can also work with ISO image and DVD folders) and your disc will be analyzed. The main movie will be identified and selected automatically, but you can opt to rip other material as well (or instead) if you want. You can add filters and effects, and you can even trim the video. With your output settings selected, hitting the 'Run' button will furnish you with ripped video in a matter of minutes. Quick, painless and perfect.